Avaya Stadium is the name of San Jose Earthquakes purpose built soccer stadium. Constructed with an initial capacity of 18,000 it is one of the most technological advance grounds in the world and was completed in time for the start of the 2015 MLS season. 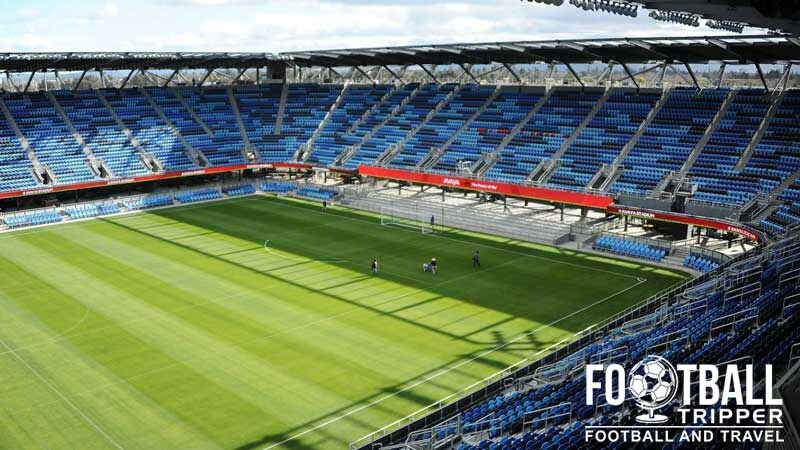 Avaya Stadium officially opened on 27th February 2015 after nearly 8 years worth of planning beginning when The Earthquakes first proposed the creation of a new stadium to San Jose City Council in June 2007. The $100 million dollar stadium was largely financed by the club selling options on the land they owned after its commercial value greatly increased after parts of it were rezoned. Designed by 360 architectures in what has been their first soccer stadium to date, the ‘visionaries’ drew inspiration from compact European grounds, and subsequently features the steepest arrangement of seating in Major League Soccer. 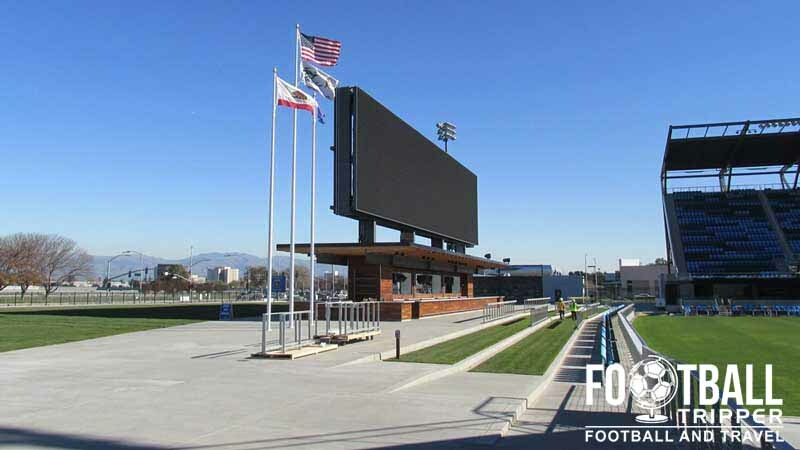 This give The Earthquake’s stadium a real sense of intimacy that some of the larger American Stadiums arguably lack. The groundbreaking ceremony took place on the 21st of October 2012 which saw 6,256 fans simultaneously dig spades into the dirt, with the site previously cleared after demolition occurred on March the previous year. Construction took approximately 3 years in total, and overran slightly as President Dave Kaval initial had hopes to open in time for the second half of the 2014 MLS Season. The new ground features a canopy roof to ensure lots of material light inside the ground, and multi-coloured blue seats to represent The Earthquake’s diversity. It is embedded within a wider area containing a mix of residential and commercial properties. In November 2014 it was announced that the stadium would officially become the Avaya Stadium after the club signed a 10 year deal with the Californian based technology firm. The inaugural match was held against state rivals Los Angeles Galaxy on February 28th 2015 in a pre-season “friendly”, and was followed by game a month later against Chicago Fire which represented the first competitive fixture within the Major League Soccer to be held at the Avaya. At the north-end of the Stadium there is the largest outdoor bar in North America which apparently covers 3,647 square feet with 45 beer taps in action, and towards the south side there is the smaller World of Beers which does what it says on the tin. Located next to one of Santa Clara University Campus there are numerous fast-food joints within a 10 minute walk of the ground including the likes of In-N-Out Burger, McDonald’s and Taco Bell. Inside the stadium complex there are also plenty of options from the traditional American Classics to more multi-cultural offerings. 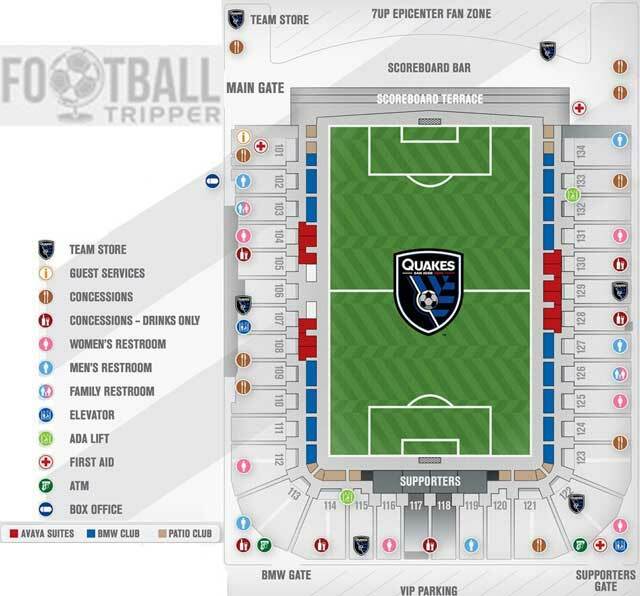 San Jose Earthquakes operate a club shop at Avaya Stadium known as the Quakes Team Store. Located next to the main entrance gate, this is the best place to purchase merchandise with the exception of the club’s official MLS Store which can be accessed 24/7 online. Please note that there are also numerous merchandise kiosks located throughout the concourses on game days. Due to high demand from fans of San Jose Earthquakes the club have agreed to offer tours of the Avaya Stadium starting from the 2015 season. As the tour programme is very much in its infancy there’s a lack of official information such as prices and times, with The Earthquakes asking fans to complete this form to book a tour. Inside the impressive “locker room” of San Jose Earthquakes. 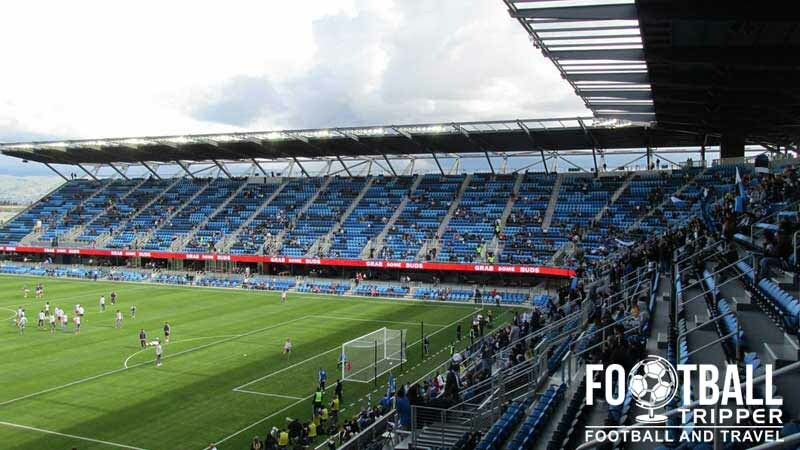 Tickets to see San Jose Earthquakes play at their new stadium generally range between $20.00 for the supporters terrace for fans who wish to stand and up to $130.00 for bang in the middle VIP areas. The most common way to buy tickets is from the club’s official partner Ticketmaster. Please note that prices do not include booking fees which typically add anywhere between $3.00 – $5.00 depending on the value of your ticket. 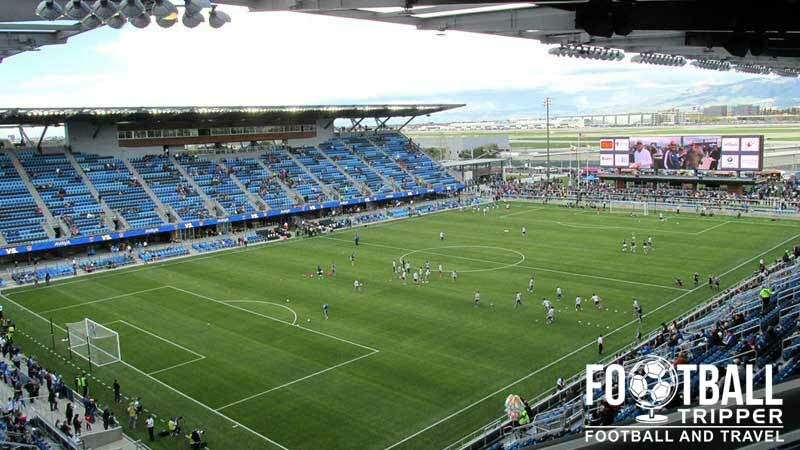 The Avaya stadium is located out of town next to Sane Jose International Airport which gives it great accessibility from the rest of America whether that’s by road or by air. The main entrance of Avaya Stadium is recognisable by the tank outside. For a comprehensive map of all on-site parking please check out this official parking map. Tailgating is allowed in all parking lots with the exception of the VIP area. Known as the VTA (Valley Transport Authority) there is a metro service which transports fans from downtown San Jose to Avaya Stadium on matchdays. Departing every 15 minutes up to two hours before kick-off, the VTA is one of the easiest ways to watch the soccer. The closest stop is the Santa Clara University on the purple Ace line or as a back up College Park Caltrain which is slightly further away. Visit this page for comprehensive timetables and further travel information. A picture of some of the fans who call themselves the San Jose Ultras. They have a great banner. There are several parking spaces for bikes next to the VIP parking lot which can be accessed from Newhall Drive. The secure bike racks give fans a greener option of getting to the Avaya. Located at the foot of San Jose International Airport rest assured that there are numerous accommodation options with a 2 mile radius or so. The closest is the Candlewood Suites Silicon Valley, and across the other side of the runways there is a Days Inn and Hilton Hotel.